Cal Fire describes their air attack soon after the Pasqual Fire broke out Friday. A brush fire forced the closure of State Route 78 midway between the San Diego Zoo Safari Park and the city of Ramona. Acreage (SUNDAY 6 A.M.): 365 acres; 80 percent contained. (SUNDAY 6 P.M) All road closures along Hwy 78 in the area of the fire have been lifted. Fire equipment will be patrolling the area so please drive with caution. (SUNDAY 6 A.M.) Cal Fire tweeted early Sunday morning that the Pasqual Fire is now 60 percent contained and remains at 365 acres. (SATURDAY 7 P.M.) - All evacuation orders are lifted for the Pasqual Fire. SR-78 from Bandy Canyon Rd. to Weekend Villa Rd. remains closed due to firefighter activity, Caltrans reports. (1:20 P.M.) — Cal Fire has adjusted the acreage of the Pasqual Fire due to more accurate mapping. The fire is now listed at 365 acres, up from 240 acres. Officials say the fire is now 40 percent contained. SR-78 remains closed between Weekend Villa and Bandy Canyon Rd. 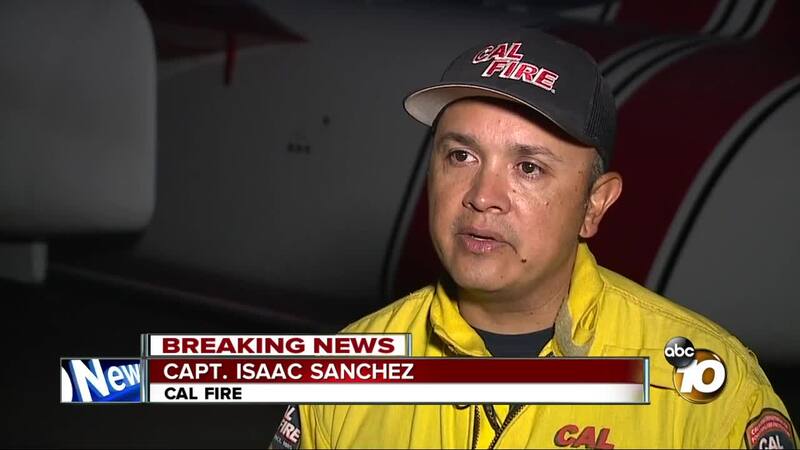 (7:25 P.M.) — Cal Fire reports forward rate of spread has been stopped at an estimated 240 acres. (5:10 P.M.) — The San Diego Sheriff's Department has issued evacuation warning and order messages to residents living near the fire zone of the Pasqual Fire. (4:47 P.M.) — SR-78 is expected to be closed throughout the night as crews battle the Pasqual Fire, according to CHP officer Mary Bailey. 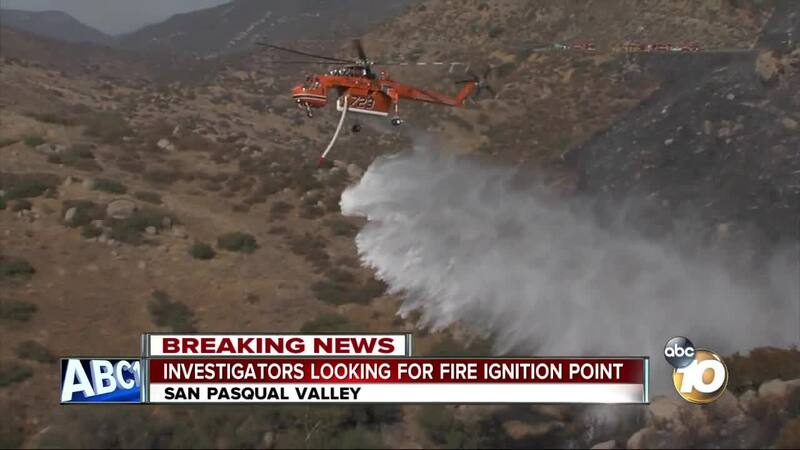 (4:15 P.M.) — SDG&E is sending its Aircrane to help firefighting efforts at the San Pasqual fire: "Our #Aircrane is helping firefighters to extinguish the #PasqualFire! We are up to 12 drops & 10,703.99 Gallons. It’s headed back for fuel and then returning soon. Stay safe!" (4 P.M.) — Per Cal Fire, evacuation orders have been given for Rangeland Rd., Oak Grove Rd., Highland Hills Dr., Horizon View, Rio Maggiore Dr., Cinque Terre Dr., Corniglia Dr., Via Cuesta, Via Vista Grande, Prestige St., Rancho Villa Rd., Weekend Villa Rd., Day Star Way, and Rustic Villa Rd. SAN PASQUAL, Calif. (KGTV) - A brush fire forced the closure of State Route 78 midway between the San Diego Zoo Safari Park and the city of Ramona Friday afternoon. The flames broke out before 2 p.m. on the 18500 block of San Pasqual Valley Road, which is also SR-78, Cal Fire San Diego reported. The location is east of San Pasqual Academy, which houses foster children. At least 225 acres burned by about 3 p.m., firefighters reported. Ramona High School at 1401 Hanson Lane in Ramona. Red Cross officials will be at the school to provide snacks and drinks to evacuees. SR-78, between Bandy Canyon Rd. and Haverford Rd. Eastbound SR-78 at Highland Rd. Westbound SR-78 at Haverford Rd. 10News reporter Rina Nakano is gathering information at the command post. Firefighters told her the fire is spreading east and a little north toward the Weekend Villa area. The flames are currently in the City of San Diego but are creeping onto state land and headed towards federal land. A San Diego Zoo Safari Park employee told 10News the facility was preparing crates to evacuate the animals if necessary. 10News reached out to the Rancho Guejito Vineyard, which is near the fire. An employee said she could see smoke. Other North County residents, including some in Escondido, reported seeing smoke. Temperatures in Ramona were 100 degrees, with 21 percent humidity.